Helpt u ons aan 500 donateurs om kanker-actueel online te kunnen houden? Rucaparib (RUBRACA) een zogeheten parpremmer verlengt als onderhoudsbehandeling de progressievrije overleving met meer dan 100 procent in vergelijking met een placebo bij vrouwen met een recidief van platinum-gevoelige (chemo gevoelig) eierstokkanker. De ziektevrije en progressievrije overleving in vergelijking met een placebo was beduidend beter voor rucaparib, 13,6 maanden vs 5,4 voor placebo bij alle deelnemende patiënten ongeacht hun BRCA status. Dus ook bij vrouwen met eierstokkanker die geen BRCA mutatie hebben zorgt rucaparib (RUBRACA) voor uitstekende resultaten. Bij vrouwen met wel een BRCA mutatie status waren de resultaten nog beter, 16,6 maanden voor rucaparib versus 5,4 maanden voor placebo. Blijkt uit de ARIEL3 fase III studie. Abbreviations: BRCA, breast and ovarian cancer susceptibility gene; CI, confidence interval; CA125, cancer antigen 125; HRD, homologous recombination repair deficiency; LOH, loss of heterozygosity; ORR, objective response rate; PFS, progression-free survival; RECIST, Response Evaluation Criteria In Solid Tumors (Version 1.1). Op basis van een intent-to-treat analyse was de mediane progressievrije overleving 10,8 maanden (95% betrouwbaarheidsinterval 8,3 - 11,4) met rucaparib, vergeleken met 5,4 maanden (95% betrouwbaarheidsinterval 5,3 - 5,5) voor placebo (P <.0001 ). Van de 354 homologe recombinatie-deficiënte patiënten was de mediane progressievrije overleving met rucaparib 13,6 maanden (95% betrouwbaarheidsinterval 10,9 - 16,2) en 5,4 maanden voor placebo (95% betrouwbaarheidsinterval 5,1 - 5,6) (p <.0001). Bij de 196 patiënten, specifiek met BRCA-mutaties, was de mediane progressievrije overleving voor rucaparib 16,6 maanden (95% betrouwbaarheidsinterval 13,4 - 22,9) en 5,4 maanden voor placebo (95% betrouwbaarheidsinterval 3,4 - 6,7) (P <.0001). De meest gemelde aan de behandeling gerelateerde bijwerkingen waren misselijkheid en braken, evenals asthenie en bloedarmoede. De auteurs melden dat deze consistent zijn met eerdere studies van rucaparib. De bijwerkingen werden behandeld met profylactische en / of ondersteunende zorg, onderbrekingen in de behandeling en / of dosisverlagingen. Rucaparib effectively increases progression-free survival with high-grade, recurrent, platinum-sensitive ovarian cancer regardless of HRR status. They suggest that it could be considered as a new standard of care for women with platinum-sensitive ovarian cancer following a partial or complete response to second-line or later platinum-based chemotherapy. Het volledige studierapport van de HOPA gepresenteerde studie is in december 2017 gepubliceerd in The Lancet: Rucaparib maintenance treatment for recurrent ovarian carcinoma after response to platinum therapy (ARIEL3): a randomised, double-blind, placebo-controlled, phase 3 trial en tegen betaling in te zien. Rucaparib, a poly(ADP-ribose) polymerase inhibitor, has anticancer activity in recurrent ovarian carcinoma harbouring a BRCA mutation or high percentage of genome-wide loss of heterozygosity. In this trial we assessed rucaparib versus placebo after response to second-line or later platinum-based chemotherapy in patients with high-grade, recurrent, platinum-sensitive ovarian carcinoma. In this randomised, double-blind, placebo-controlled, phase 3 trial, we recruited patients from 87 hospitals and cancer centres across 11 countries. Eligible patients were aged 18 years or older, had a platinum-sensitive, high-grade serous or endometrioid ovarian, primary peritoneal, or fallopian tube carcinoma, had received at least two previous platinum-based chemotherapy regimens, had achieved complete or partial response to their last platinum-based regimen, had a cancer antigen 125 concentration of less than the upper limit of normal, had a performance status of 0–1, and had adequate organ function. Patients were ineligible if they had symptomatic or untreated central nervous system metastases, had received anticancer therapy 14 days or fewer before starting the study, or had received previous treatment with a poly(ADP-ribose) polymerase inhibitor. We randomly allocated patients 2:1 to receive oral rucaparib 600 mg twice daily or placebo in 28 day cycles using a computer-generated sequence (block size of six, stratified by homologous recombination repair gene mutation status, progression-free interval after the penultimate platinum-based regimen, and best response to the most recent platinum-based regimen). Patients, investigators, site staff, assessors, and the funder were masked to assignments. The primary outcome was investigator-assessed progression-free survival evaluated with use of an ordered step-down procedure for three nested cohorts: patients with BRCA mutations (carcinoma associated with deleterious germline or somatic BRCA mutations), patients with homologous recombination deficiencies (BRCA mutant or BRCA wild-type and high loss of heterozygosity), and the intention-to-treat population, assessed at screening and every 12 weeks thereafter. This trial is registered with ClinicalTrials.gov, number NCT01968213; enrolment is complete. Between April 7, 2014, and July 19, 2016, we randomly allocated 564 patients: 375 (66%) to rucaparib and 189 (34%) to placebo. Median progression-free survival in patients with a BRCA-mutant carcinoma was 16·6 months (95% CI 13·4–22·9; 130 [35%] patients) in the rucaparib group versus 5·4 months (3·4–6·7; 66 [35%] patients) in the placebo group (hazard ratio 0·23 [95% CI 0·16–0·34]; p<0·0001). In patients with a homologous recombination deficient carcinoma (236 [63%] vs 118 [62%]), it was 13·6 months (10·9–16·2) versus 5·4 months (5·1–5·6; 0·32 [0·24–0·42]; p<0·0001). In the intention-to-treat population, it was 10·8 months (8·3–11·4) versus 5·4 months (5·3–5·5; 0·36 [0·30–0·45]; p<0·0001). Treatment-emergent adverse events of grade 3 or higher in the safety population (372 [99%] patients in the rucaparib group vs 189 [100%] in the placebo group) were reported in 209 (56%) patients in the rucaparib group versus 28 (15%) in the placebo group, the most common of which were anaemia or decreased haemoglobin concentration (70 [19%] vs one [1%]) and increased alanine or aspartate aminotransferase concentration (39 [10%] vs none). Across all primary analysis groups, rucaparib significantly improved progression-free survival in patients with platinum-sensitive ovarian cancer who had achieved a response to platinum-based chemotherapy. 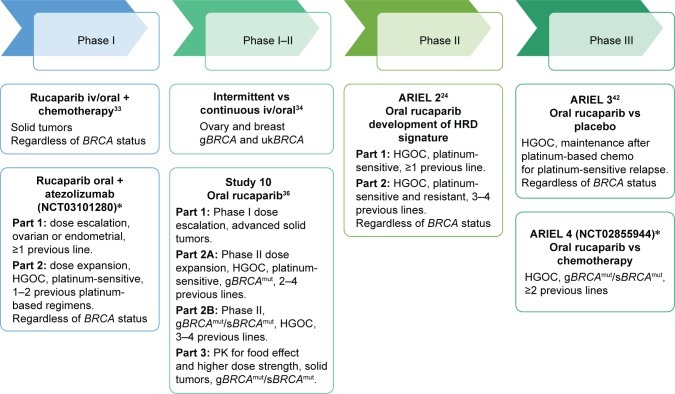 ARIEL3 provides further evidence that use of a poly(ADP-ribose) polymerase inhibitor in the maintenance treatment setting versus placebo could be considered a new standard of care for women with platinum-sensitive ovarian cancer following a complete or partial response to second-line or later platinum-based chemotherapy. YD is an investigator on clinical trials of olaparib and rucaparib, has participated in advisory boards for Clovis Oncology and AstraZeneca, has received research grant support from Clovis Oncology, and was involved in the preclinical and clinical development of rucaparib. Newcastle University receives royalties for rucaparib. The authors report no other conflicts of interest in this work. 8. fda.gov [webpage on the Internet] FDA Approves Olaparib Tablets for Maintenance Treatment in Ovarian Cancer. [Accessed September 3, 2017]. Available from: https://www.fda.gov/drugs/informationondrugs/approveddrugs/ucm572143.htm. 9. fda.gov [webpage on the Internet] FDA Grants Accelerated Approval to New Treatment for Advanced Ovarian Cancer. [Accessed September 3, 2017]. Available from: https://www.fda.gov/newsevents/newsroom/pressannouncements/ucm533873.htm. 10. fda.gov [webpage on the Internet] FDA Approves Maintenance Treatment for Recurrent Epithelial Ovarian, Fallopian Tube or Primary Peritoneal Cancers. [Accessed September 3, 2017]. Available from: https://www.fda.gov/NewsEvents/Newsroom/PressAnnouncements/ucm548948.htm. 47. Rebecca Sophie Kristeleit M. PhD phase 1/2 study of oral rucaparib: FINAL phase 1 results. Abstract presented at: ASCO; June 1; 2014; Alexandria, VA.
50. The study of oral rucaparib in patients with a solid tumor (Phase I) or with gBRCA mutation ovarian cancer (Phase II) [Accessed September 3, 2017]. Available from: https://clinicaltrials.gov/ct2/show/NCT01482715. NLM identifier: NCT01482715. 53. National Comprehensive Cancer Network I, [webpage on the Internet] NCCN Guidelines for Supportive Care. [Accessed September 3, 2017]. Available from: https://www.nccn.org/professionals/physician_gls/f_guidelines.asp#supportive. 1 Reactie op "Parpremmer rucaparib verdubbelt ziektevrije overleving (5 vs 11 en 13 maanden) bij chemo gevoelige eierstokkanker. Ook bij patienten zonder BRCA mutatie is rucaparib effectief"
Ook de niraparib (Zejula) laat goede resultaten zien en schijnt al goedgekeurd te zijn door de EMA. Wie kan hier antwoord op geven?